The beauty industry has capitalized on this truth, offering an endless supply of overnight products that aim to take advantage of your non-waking hours and promising all kinds of nocturnal benefits to help make sure you wake up looking better than when you hit the hay. The downside, for all you Princess and the Pea types out there, is that some of these aren't easy to fall asleep in — they can feel too goopy, too thick, or just feel kind of gross. So here, we lay out the face and hair products that really do work their magic overnight and won't ruin your pillowcases, plus some beauty sleep tips from the pros. Sweet dreams — and see you in the morning. But before amping up our beauty sleep, our main objective when our head hits the pillow is to fall asleep — which can be easier said than done — so we want a product that doesn’t get in the way. Though they are having a major moment, just thinking about wearing a cold sheet mask overnight gives us nightmares — and if you happen to be sleeping next to someone, it certainly will for them, as well. Unless you don’t mind waking up to a mess on your pillow, cream masks are also better left to daylight hours. 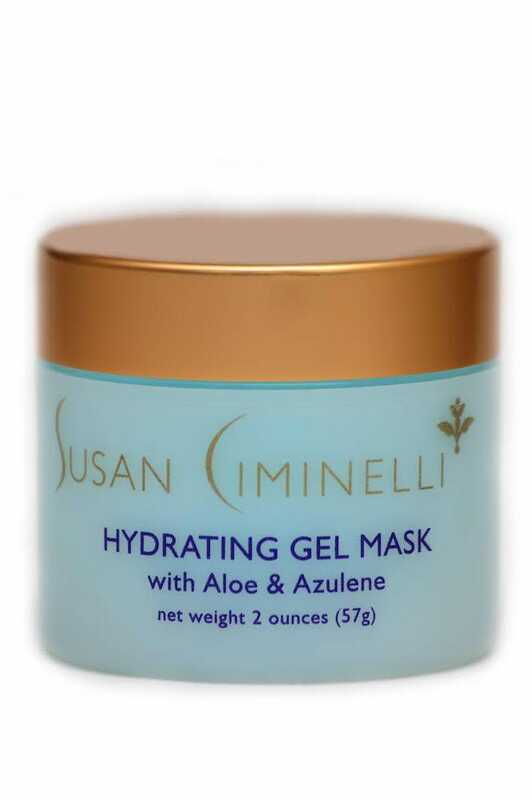 Celebrity facialist Susan Ciminelli's super-quenching mask is formulated with powerful antioxidants (like Japanese green tea and soothing aloe and lavender) and should be applied in a thick layer 30 minutes before bed. (Just be sure to avoid the eye area.) By the time your head hits your pillow, it will have become one with your skin. 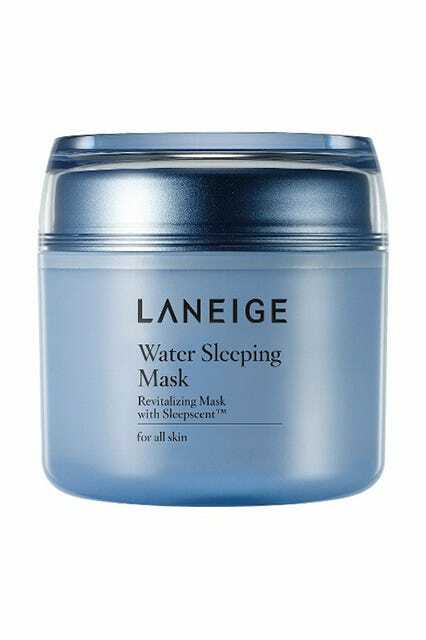 When Tan developed the Deepsea Hydrating Mask (a transparent gel mask made with deepsea water from Japan, soya bean extract, and hyaluronic acid that absorbs quickly into the skin), one of her main objectives was to make wearing it comfortable enough to sleep in. Aim to apply it about 5 to 10 minutes before you’re ready to go to bed on cleansed skin. The mask will function as your night cream and undereye cream as well, so no need to apply those. In the morning, simply rinse with warm water and cleanse as usual. This mask is clay, not gel, but if you apply just a thin layer to your skin before you go to bed, you’ll still sleep comfortably while it detoxifies. “It really draws imperfections out of skin,” says Dr. Kazin. If you’re not into feeling of clay all over your face, you can use it it as a spot treatment, instead. “Spot treating blemishes overnight with a good clay mask is comfortable to sleep in, since this can be more targeted where you place the clay mask, e.g., just on the zit,” says Ciminelli. This mask is for those who have anti-aging concerns. The mix of clay, shea butter, and algae extract feels weightless on the skin. And in the morning, you'll notice that fine lines look softer; with regular use, you may even notice their appearance even less. "You want a mask that's not going to run off on your pillow and sheets, or form a hard shell. Masks that absorb into skin or dry quickly are best for sleep,” says Dr. Kazin. If you don't like the idea of heading to bed with something cold on your face (especially in winter), rub the product in your hands before you apply to get it up to room temp. 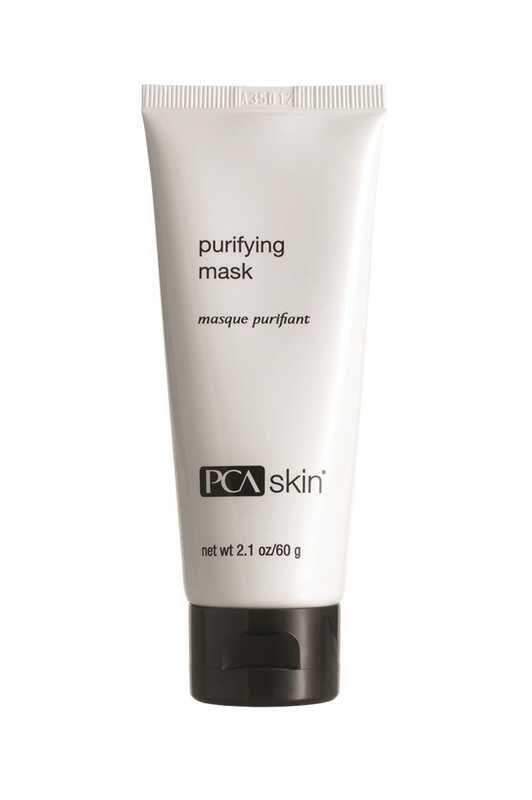 This mask soaks in fast (leaving no residue), while also hydrating even the driest of skin. It also helps seal in any serums or creams you layered on before it. In other words, it's like adding a super-charge to your nightly regimen. Also, for those who don't shy away from fragrance, its "aromatic sleepscent" made of orange flower, rose and sandalwood is as dream-inducing as counting sheep. Algenist's Splash is similar to Laneige in that it delivers a healthy dose of moisture in a gel formula. Plus, it has no fragrance, so you can slather on even if you have the most sensitive of skin. This mask can be used one of two ways. You can either pile on a bunch and wear it for about 15 minutes, or you can swipe on a thin layer and snooze. The royal jelly in the formulation helps promote cell turnover thanks to a high volume of vitamins and amino acids. Orlane Crème Royale Sublime Mask, $250, available at Neiman Marcus. For nights when you're feeling especially chapped, apply a thin layer of Glossier's Moon Mask before you sleep. Pro tip: Pop it into the fridge before you apply for a soothing splash that's also nice and cooling. Glossier Moisturizing Moon Mask, $22, available at Glossier. Love the smell of banana? You'll dig TonyMoly's Banana Sleep Pack. It utilizes chamomile extract and honey to calm and moisturize. Plus, how adorable is this packaging? Tony Moly Banana Sleep Pack, $16.50, available at Ulta Beauty. When it comes to overnight hair treatments, think about it the same way as your skin. Okay, so your hair might not fully rejuvenate itself in the wee hours, but the longer the product has to penetrate into your strands, the better. Celebrity hairstylist and salon owner Adel Chabbi says the best products to sleep in are deep-penetrating oils with no added silicone — and they're great for the scalp, too. You may want to lay a soft towel over your pillow, just to make sure to keep your sheets clean. If you aren't able to wet your hair before bed or are scared of your sheets getting a little messy, there are non-oil-based overnight options, too. Whatever treatment you choose, it's a good idea to keep your hair up, too. Chabbi suggests sleeping with it in a loose bun or braid to get the most benefit from the product and the most comfortable rest. “Another option is to wear a bandana along your hairline to minimize the product getting on your skin during application,” says Lauder. 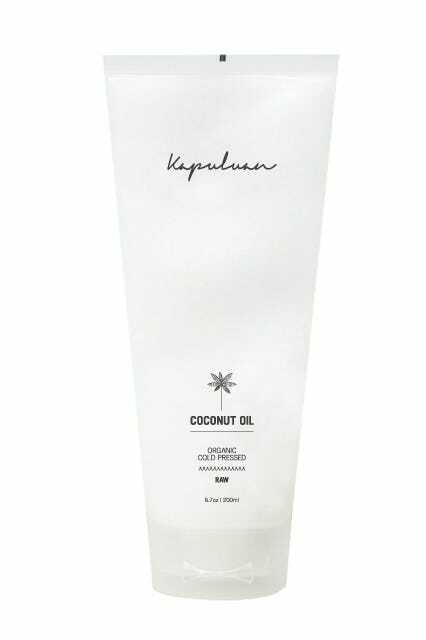 Coconut oil makes for a great overnight mask, because it absorbs into the hair extremely well. “When you apply hair masks, it is best to start at the tips and work your way up to the scalp,” says Lauder. This will concentrate the oil on the ends and middle part of your hair, where it needs the most love (i.e., is the most dry) and keep from getting too much excess oil on your face and scalp. Jasmine oil is a little pricey, but comes highly recommended from Chabbi. It’s particularly good for those with dry hair and those who are prone to frizziness. Apply it to the ends of your hair and comb through — don't forget to massage it into your scalp. 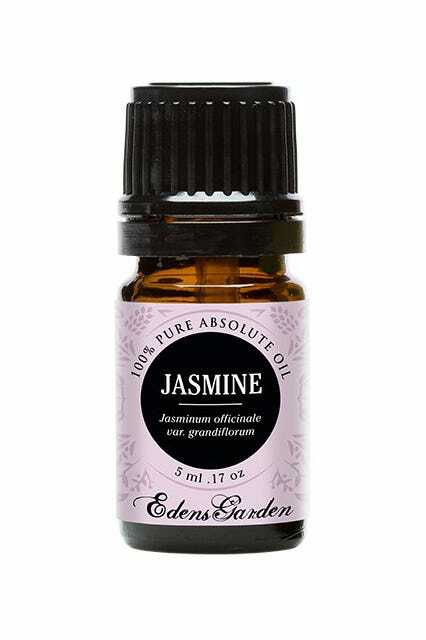 And for you floral fragrance lovers, sleeping with jasmine oil in your hair will not only soothe you to sleep (studies have likened its effects to that of Valium), it will give you such sweet (smelling) dreams. 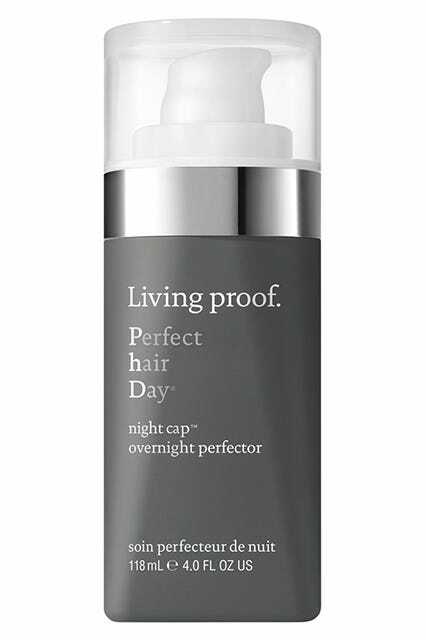 If you don’t like going to sleep with wet hair, this is the overnight product for you. You can apply it to dry (or wet) hair, and the weightless formula immediately absorbs into your strands and never ends up on your pillow. Start with a few pumps and apply to the ends, working your way up, continuing to apply more depending on the thickness of your hair. Hit the sack and sleep as you normally do, but this time you’ll wake up with hair that is noticeably softer and silkier. AND, you don’t have to wash it out in the morning (like with oils) — you can just style and go. 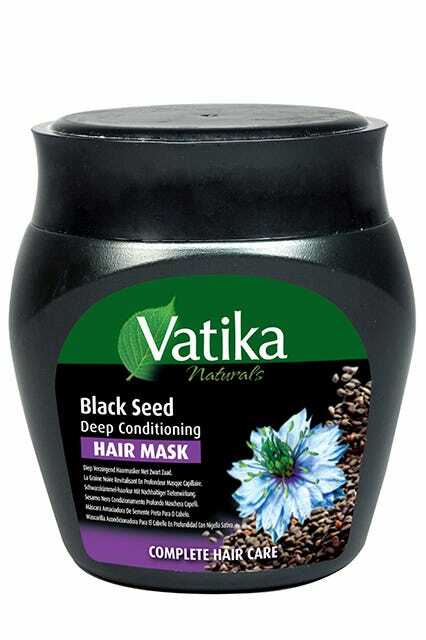 Black seed oil is another of Chabbi’s hair mask favorites for its ultra-penetrating power — and it’s the hero ingredient in this deep conditioning mask. Though you won’t see the European brand at regular drugstores in the States, you can find this mask in some Asian stores and online. Simply run it though your hair, concentrating more on the ends. Then, twist your hair into your sleeping updo of choice and lay down your head. Your skin is not the only thing the can benefit from anti-aging products — your hair ages with time, too. 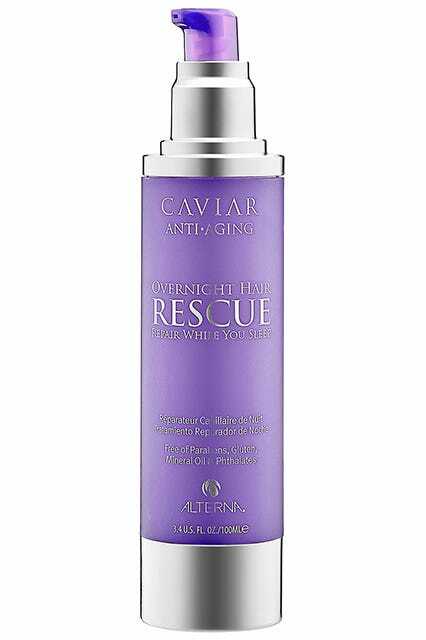 This caviar-infused treatment from Alterna is on an overnight mission to repair all kinds of hair damage, like split ends, brittle hair, and just all-around dull locks. Apply it on dry hair two to three times a week, get your eight hours in, and wash it out in the a.m. The vitamin C-rich formula will help combat hair-aging. Moroccanoil's hair mask is a cream version of their treatment oil. It's intensely hydrating and will leave your strands silky smooth. And since it's thicker, it won't muck up your pillow case the way a greasy oil might. Moroccanoil Intense Hydrating Mask, $16, available at Nordstrom. Orlando's Pita new-to-market mask acts the same way as a silk pillow case does. It helps to maintain shine and reduce frizz while maintaining major moisture. Orlando Pita Play Satin Pillow Overnight Hair Mask, $32, available at Ulta Beauty. Hair fried? Meet your new BFF. Sachajuan's mask is water-based, so it won't leave oily marks behind. But it also utilizes algae in its formulation, helping your strands to become more elastic and shiny. Sachajuan Overnight Hair Repair, $66, available at Birchbox.